Of late with my move (finally) to our new smalish Kitsilano digs stress has been finally eased. But during the moving turmoil that included a flood in my basement (the old house) that terminated my goal of printing as much of the photographic paper that I had there were two moments of peace, relaxation and adventure. Both were musical events. One was a solo cello concert by Marina Hasselberg who featured the music of very alive and mostly very young Vancouver composers. 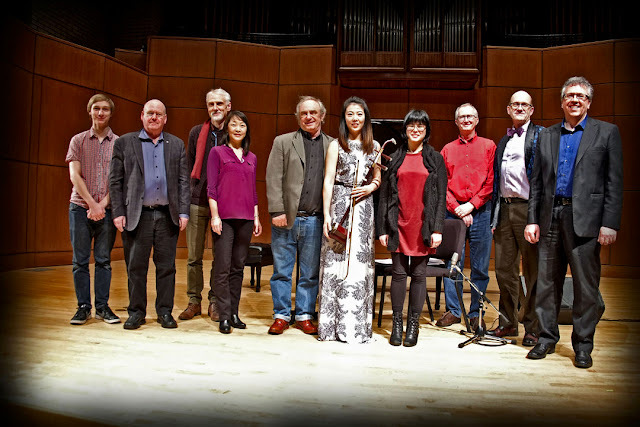 The other was a concert by erhu player Nicole Ge Li in her Piano & Erhu Project (PEP) with noted UBC pianist and instructor Corey Hamm. I have been unable to write about the experience until now because of computer problems, old phoneproblems (a dying iPhone 3G) new phone problems ( a Galaxy S5) and five days of random disappearance of email from all my platforms. At one point when I was receiving “phantom” emails in my 3G that were not there when they finally downloaded I suspected that my family and friends from the beyond were attempting to communicate with me. The two extremely unusual concerts (with all the time that I subsequently had to think about them) made me linger in concerts past. I remember the first one I ever attended. My parents took me to the Teatro Colón in 1950 (I was 8) to a piano recital by Arthur Rubinstein. It was in the middle of the harsh and humid Buenos Aires winter. Rubinstein appeared wearing tails, bowed to us and sat down. Before he could begin there was loud coughing in the audience. He waited and when he was about to start the coughing persisted. He got up and faced us. He removed a pen (or pencil) from his front pocket and directed us to cough in unison. Coughing ceased. He then played. It was then that the audience noted that he was drunk. The Buenos Aires concertgoers showed their displeasure by showering him with coins (aimed to hit him). He left in a huff. We waited for about 30 minutes. He returned and played beautifully. In 1965 my then my musically inclined Argentine girlfriend called Susana told me that I was a cultural aberration and that I needed some prodding in that department. She bought good seats at the Teatro Colón for an opera. The opera was a rare one called The Fiery Angel by Sergei Prokofiev. This was during the sweltering and humid Buenos Aires summer. I had only one suit which was an American-made black wool Botany Bay. I suffered. To this day I love Prokofiev and particularly his Romeo & Juliet when danced by Evelyn Hart. Both Nicole Ge Li and Marina Hasselberg share the same age (around 30). 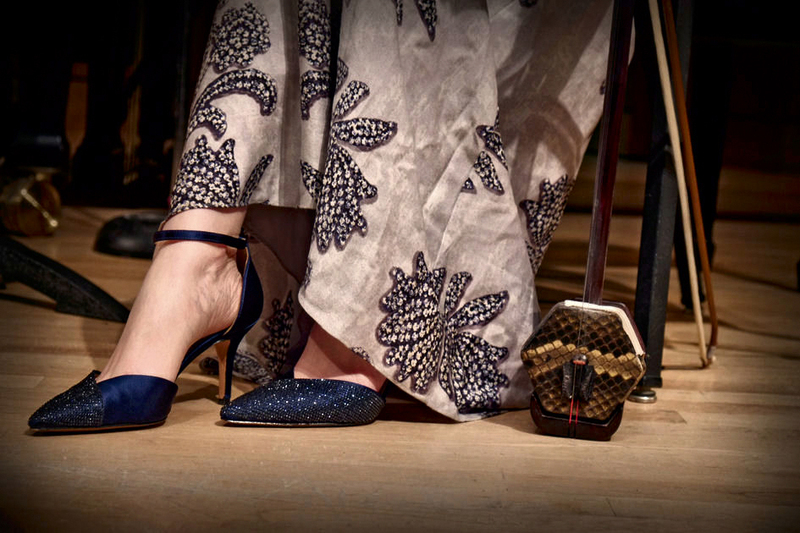 Both understand the importance of image and wear spectacular clothing, shoes and sometimes (yes!) fishnets. Both understand the trap that playing a conservative and established repertoire can be and how boredom can set in. Li plays a classic Chinese instrument called an erhu. For most who might have heard the instrument played as part of Chinese music or in bad films with a so-called Chinese theme including the idea of the inscrutable and alien music of the orient Li brings something refreshing to the table. For years I disliked the sound of the soprano saxophone especially when played by that jazz master that was Sidney Bechet. I could never warm up to the instrument even though I played the alto saxophone (no more than efficiently). It wasn’t until I heard local composer Colin MacDonald play his soprano and make it sound like a flute in a Vivaldi concerto that I began to love the instrument. Li has made the sound of the erhu one of comfort so that when she and her crony (of the PEP project) Corey Hamm venture into dissonance it all happens seamlessly and I find pleasure in it. Marina Hasselberg has a worldwide competition of many other young attractive cello players. I remember years ago going to see Shauna Rolston play her cello and how I was transfixed by her belly dancer-style upper-arm band on her left arm. It was part of her image and she could have played Webern and I would not have minded. Hasselberg’s solution is an uncubbyholed versatility. She plays two kinds of cellos. 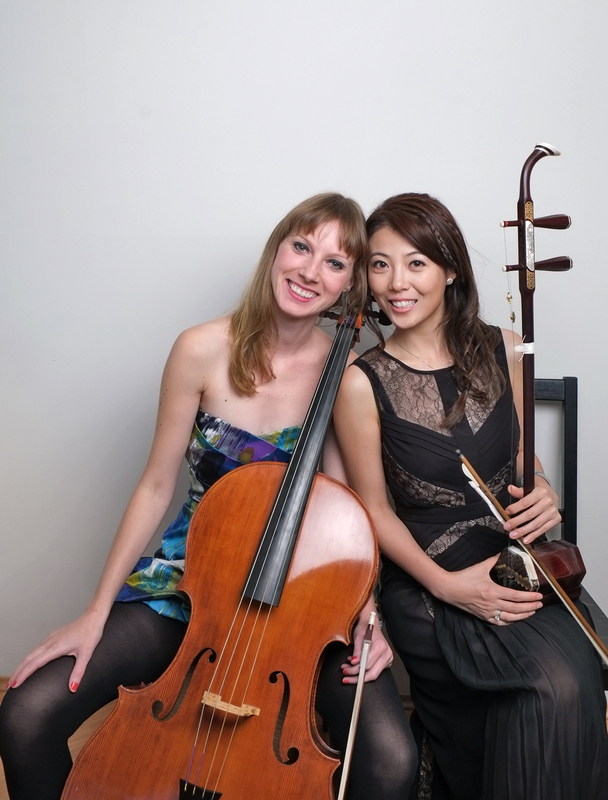 The classic modern cello (with its signature metal end-pin) and the warmer sounding baroque cello (gut strings) and no end-pin. Hasselberg plays the established repertoire, baroque repertoire and seeks contemporary composers to compose works for her cello, even an amplified one. It is symmetrically neat for me to report that both Li and Hasselberg appeared in the Georgia Straight’s 2014 Fall Arts Preview with my portrait of them to illustrate the piece. Hasselberg will be giving a concert Echoes soon. Here is the info. Li will be touring China with Hamm this year. Whenever possible I attend concerts by this pair. It is my hope that Mark Armanini will soon compose something for this exciting pair to play together. Things Fall Apart, by Craig Aalders. 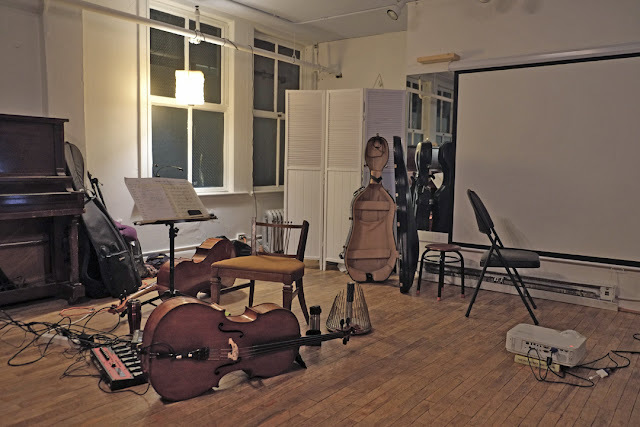 Solo cello and electronics with amplified cello and Craig on electronics. Michael Oesterle piece Rambler Rose for solo cello, video by Morgan Burke on artist Erik Whittaker's kinetic sculpture (train). 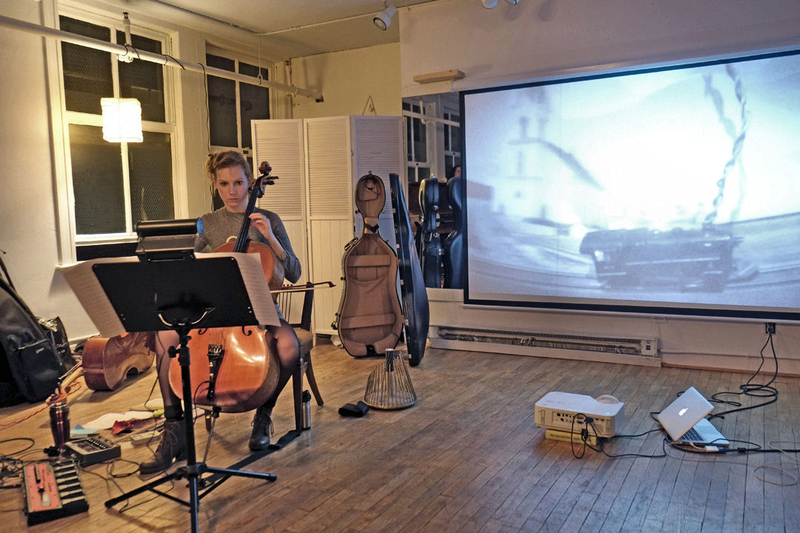 In that concert (Echoes 1) on January 15 one of the pieces, Michael Oesterle’s Rambler Rose had a video by Morgan Burke that featured a train. This brought memories of Heitor Villa-Lobos’s The Little Train of Caipira which had some of the sounds of that composer in Oesterle’s composition. It is my suspicion that when Arthur Rubinstein told the world of Heitor Villa-Lobos and made the composer famous it might have happened at about the time that I saw Rubinstein at the Colón.